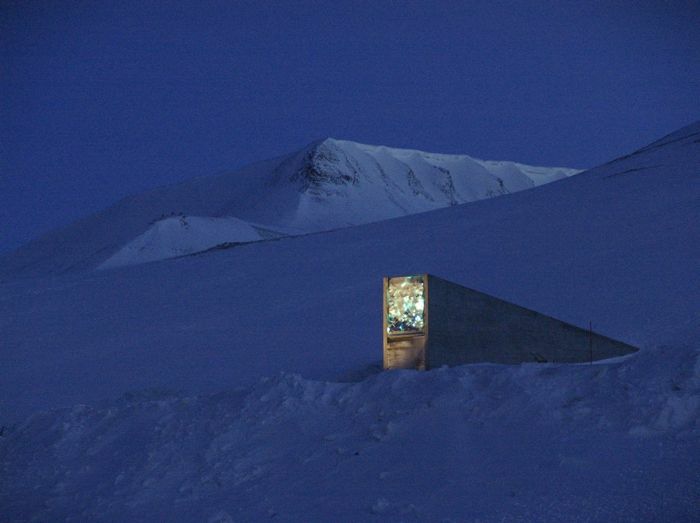 The Global Seed Vault on Svalbard archipelago way up near the North Pole is not in Japan, nor have I ever been there. It is however a very cool post-apocalypse place, an insurance policy for the Earth and human-kind in the event of rampant global disease or massive nuclear fallout, and as such belongs on a site mostly about ruins as much as anything. 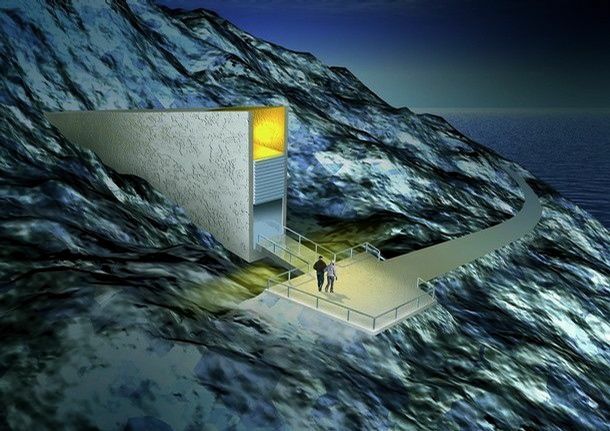 The Global Seed Vault is an Ark for a potentially coming flood- one of epidemics and all-out nuclear war. 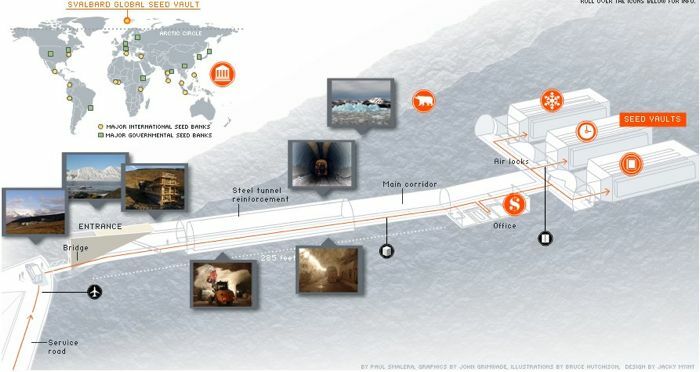 It is ensconced 120 meters into the solid rock of the Svalbard archipelago (featured prominently in the excellent ‘His Dark Materials’ books by Philip Pullman), deep enough to withstand any nuclear blast, welded shut with huge hermetic blast doors, kept at freezing temperatures, and storing millions of samples of seeds. How to rob the Seed Bank. It was built with funds from some European countries like Sweden, Norway, the UK, as well as the Bill and Melinda Gates foundation. It wasn’t cheap- more details here. 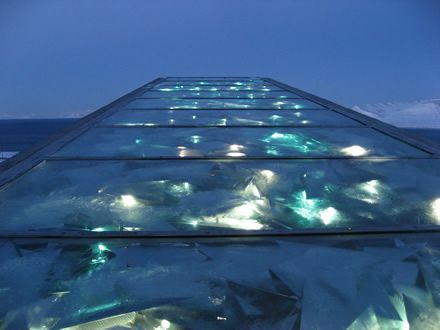 A 2001 tor for Polar bears. Facts – Opened 2008, conglomerate funding from charities and countries. Highlights – Will out-last the Pyramids. As long as dangerous people like Monsanto exist in the world humanity must do what it can to protect itself from them. Those people (Monsanto and like kinds) are one engineering error away from producing a “Super-Weed” with the potential of destroying all arable farmland in the world as fast as if can spread! Tinkering with nature on this scale must be better controlled! Farmers in Saskatchewan, Canada were grossly mistreated by Monsanto and a very sick, pro multinational corporation Steven Harper Conservative government – Thank God, a Socialist, liberal coalition jumped in ! We need seed banks to save ourselves from greedy vulture-Capitalists with loyalty to shareholders first and only! I remember reading the stories when it was built, but had never seen pictures. Pretty amazing! Coal mined locally keeps it the temperature lower? What if there’s a nuclear blast and the coal mine is wiped out? Will there just be slightly less reliability, or will it throw a monkey wrench in the whole thing? It has to be fueled to keep the internal ambient temperature constant? Seems like a design flaw to me. Shouldn’t they assume that anything that is going to disrupt society enough to make this needed is enough to disrupt fueling, even if the fuel is local? An ideal installation would stay dormant at a constant ambient temperature without human input, but would need periodic human input to keep it dormant: say once a decade. It should also have an automatic method of seeding the environment: ICBMs aimed at different climatic zones with the appropriate seeds. That way, once human input is disrupted by a breakdown in society, or our extinction by nuclear winter, the facility reseeds Earth. I have read proposals for just such on our moon, but the cost of getting the materials is prohibitive. It is also unnecessary, in a sense, because even we cannot rid life from Earth. We can only rid all life that is beneficial to us, and ourselves. It’s a project with aid from the Founder of Microsoft. They will have to build a few of these before they get it right. I agree. especialy high risk is monsanto’s “terminator” gene. nothing I mean NOTHING is invulnerable from tectonic plate shifting , the planet flipping on its axis, a large enough meteor strike, etc. the doors may be sealed but if the plant flips on its axis, who would be able to dive 3 miles down into the ocean to recover the seeds; it would take 12,000 to build up a civilization capable to developing the technology of a submarine to be able to do that, assuming icealand is not buried under another 2-5, to 10 miles of rock underneath the ocean? 1) How do you plant seeds in nuclear tundra? 2) Where does the oxygen come from when people need to use it as a bomb shelter? 3) How do you prevent pesky picnic ants from carrying the seeds off into little crevices? Start over! This time, shape it like a heart. 1) How do you plant seeds in nuclear tundra? You don’t. You transport them. 2) Where does the oxygen come from when people need to use it as a bomb shelter? Only few people will have access. Layered air filtration will work. obviously you’d have to grow them indoors with air filtration using plant lights. Shouldn’t it be solar powered or something? 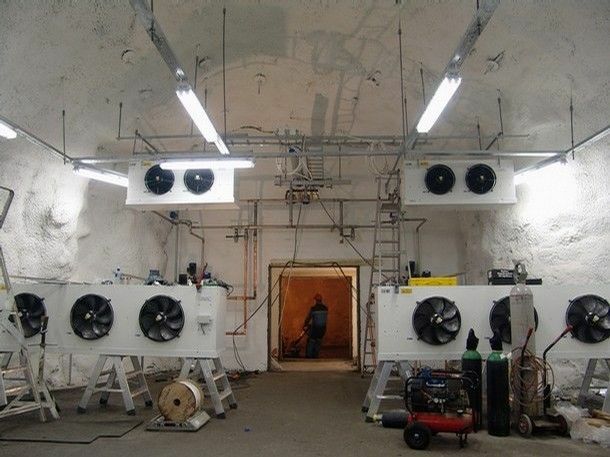 As I understand it, the seed bank is kept at -18 C using refrigeration, but if the system went bad for one of many reasons, the temperature would only climb to around -3 C over the next decade. The former temperature is optimal, but the latter will allow the vault to retain the seeds for many years, even so. 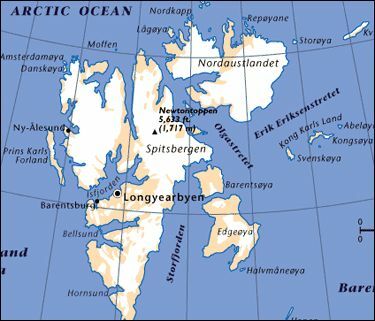 I believe Norway has the most significant key to this, but I think it’s protected by international treaty. This reminds me a lot of the cool speculative stuff on the Venus Project website, a place I imagine Michael frequents occasionally. 🙂 Only perhaps better, as it’s already been actualized. Jacque Fresco was here in NYC for the Zeitgeist forum on Sunday, which I missed once again due to work, alas. 93 years old! Right on, Uncle B! I don’t see a long-term future for industrial agri-giants like Monsanto, as they depend too much on massive energy expenditures that will slowly have to wind down over time. Unless they develop nuclear-powered farm equipment. Wow, I just scared myself. . . One of the beauties of Japan is all the small-scale truck farming, and all little family plots you see out the window of virtually every train (most tilled by octogenarians it would seem). This small-scale, low-tech farming is I think our future. Thanks for the comments everyone- thanks to David for answering the questions posed by Me-a-Moi, i guess, and jamesmallon. For sure it seems like a design flaw that it requires human interaction to keep it running at optimum temperatures. The perfect facility would be totally automatic, as jamesmallon suggests. Terraform! Definitely, if we destroy the Earth and all life, we’ll need automatic re-seeding systems. But, if we destroy it so bad that we ‘need’ automatic reseeding, then ‘we’ won’t need anything, cos we’ll be long dead. still, it would be nice to think there’s a fail-safe plan for the planet. But perhaps it might be good for all existing life- or most of the more complex forms of it to die out without reseeding. The basics of life would survive, and re-evolve, perhaps into creatures this time that wouldn’t destroy themselves. Besides, Abbi (cheers 😉 ) makes the good point that seeds wouldn’t grow in nuclearized soil anyway. So I guess we’d need a latency period programmed in, perhaps 50 years? I suppose it depends on levels of exposure. Chernobyl is still abandoned- but that’s cos the plant is unexploded. Hiroshima and Nagasaki were repopulated fairly soon after their blasts, or so I think. They certainly are now. The stuff about Monsanto I’ll have to confess ignorance of- I wasn’t sure at first if Uncle B. was just spamming the site with links, but seems like Velo agrees so that’s all good. A thoughtful and hopeful endeavor against a potentially bleak future. The UN should create numerous repositories globally as insurance against the failure of one single storehouse. Each archive should be as self-sufficient as possible using locally produced renewable power sources applicable to its region – wind, water, sun, geothermal. I find coal power to be at odds with this projects. 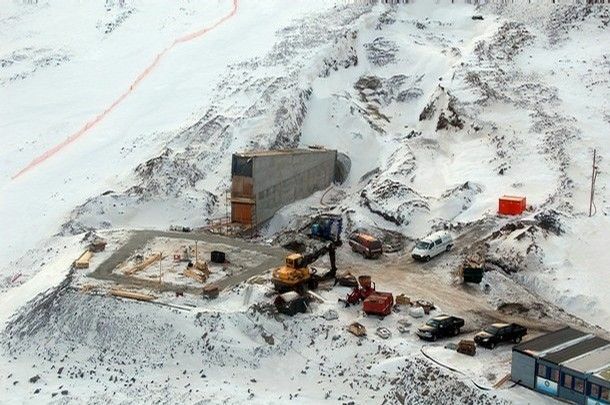 which leads to the question, how high above sea level does this facility sit if the waters do rise substantially from global warming. Monsanto does everything Uncle B stated and more – they not only create genetically modified crops that commit “suicide” after two generations (so that farmers must purchase more seed instead of saving them) and the poisons (both spray and genetic) to kill plants and insects – they also are developing GM plants that will withstand global climate change which they will hold the patents for. There is much literature out there and two very good documentaries, “The Future of Food” and “The Corporation”. I believe we need more of these facilities and other types of safeguards against future problems, but we should be working harder to stop the reasons we need them in the first place. Wow, that’s really interesting stuff. Forst time I hear or see this, thanks for posting. Read the complete response.it was good to see the responses are getting interactive. I’m sure there might be a chance to evolve a new tecnique or atleast some ways to improve from the ideas discussed by th e respondents. 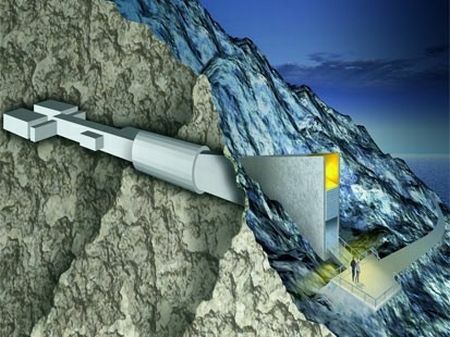 As Jamesmellon said that there has been a proposal to set up a global seed vault on the moon, and if it well be self sufficient( ie.. power for mantaining the temprature is derived from solar power), it will be a bbon for the mankind. This is awesome. it makes me wonder though, do they know something about the near future that we don’t. 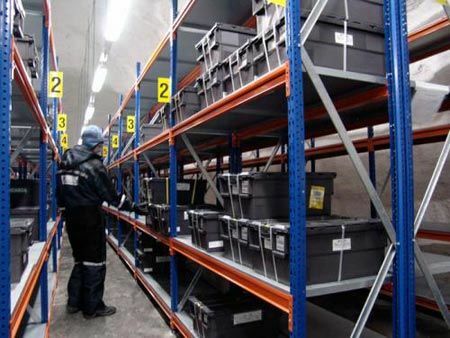 Seed banks all round the world set up by the UN is surely a noble vision thoughtbubble, though we may already be a long way towards that, with most countries instituting their own seed banks- with locations like Svalbard being their back-up. Seed vaults on the moon, or in space or in orbit, I’m as in favor of that as I am in favor of finding a way to back-up our brains onto computers, then upload that content securely to orbiting satellite stations so we will never really die, and neither will our knowledge or experience. The author Dan Simmons wrote about that kind of future in his books Ilium and Olympos, future humans never die because when they die their latest memories are Time Machined to the latest save point and restored to physical form. Neat. I P Singh you’re talking about my responses yes- not just a rote list of responses to individual comments. If so, thanks, but it takes more time to put together an integrated response that is not just a list of replies. Matt and Bronson, glad you liked it, and thanks for the support. The topic is quite hot on the Internet right now. What do you pay attention to while choosing what to write about? How well summed up your post is. Everything one would want to know about it in one article. I loved the “Cool …… place” bit. This entire project seems ‘Bond-style over the top’ to me, for many of the reasons brought up in the comments. I wonder if they throw in a few bods to deepfreeze along with the seeds 🙂 They will need knowledgeable gardeners after all. Can’t see it being of any use to humans whether there is a catastrophe or not. If you come up to those in charge and say: “we are out of this or that apple variety, can we have some more please?”, they are not going to oblige, are they? Thanks for the post and I hope you won’t mind if I put a link to it when I do my seed post. Six Pack Fast- I just pick stuff that is interesting to me, basically. I’ve had my eye on this thing for a while now. Joco- Thanks, I’m glad you found it useful. About the James Bond extreme side of things- I think that’s chiefly how media people depict it because it makes it seem cool. Actually I think it’s less romantic, less apocalypse, and more of a redundancy for the hundreds of seed banks that already exist around the world. Would it be much use in the event of global apocalypse? I very much doubt it. K Mammo- Exactly, I do agree with you, it’s about humans taking responsibility for this planet and being good custodians rather than just rapacious consumers. 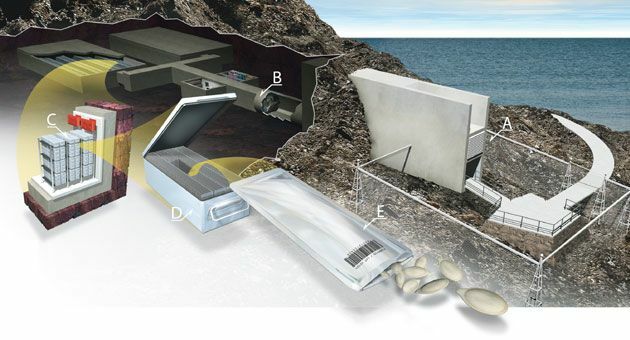 Cool stuff – I talk about this seed bank in my Enviro Science course. This article is a bit different from other stuff you post – was hoping you actually got the chance to go there your self to photograph. BTW, Chernobyl is still abandoned b/c radioactive levels in the soils are too high – not that it is unexploded. It couldn’t explode in the atomic bomb sense of ‘explode’. Some observers have noticed that wildlife has returned to the area in large numbers – but mostly b/c there are no people there. And of course they are being exposed to high levels of that stuff, and the critters will have long term effects. Curt- Wish I could get out there, maybe some day. Though oddly enough, most of the photos I’ve seen are quite unimpressive. I don’t know why that should be. Good call on the unexploded thing- of course that is not the danger. The Monsanto Corporation is a major financial contributor the seed bank; as well as Syngenta Foundation and Rockefeller Foundation. So if Monsanto is evil, doesn’t that mean the whole project is subject to Mansanto’s whims? David speculated about who had control of the bank, but does anyone really know the facts about this? The people in control of the seed bank control the food supply, and thus the survival of everyone if a catastrophe strikes our planet. 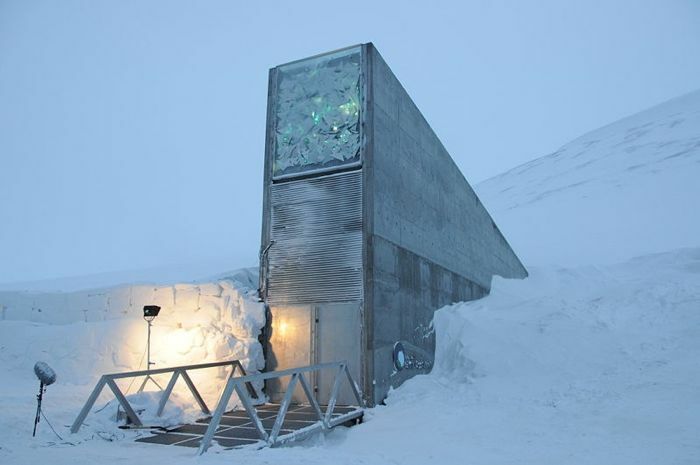 Just because this seed bank exists, doesn’t mean you’re allowed to benefit from it. We need one for genetic material of animals as well. so who has the key to get in? if it is so secure, even if the last living people got to the vault they wouldnt even be able to get inside. or plant any of the seeds in the snow. This whole thing is a scam on the world for the benefit of the few wealthy. and as if monsanto, rockerfellers, rothchilds and bill gates are going to share with any average scum like us. you folks living in fantasy land can keep on dreaming, you are going to die with the rest of us. It will or would not survive a earthquake or pole shift.